In recent decades, the Wabanaki nations of Maine—Penobscot, the Passamaquoddy, the MicMac and the Maliseet—have endured ongoing forced removal of Native children from their families by the Maine child welfare system. 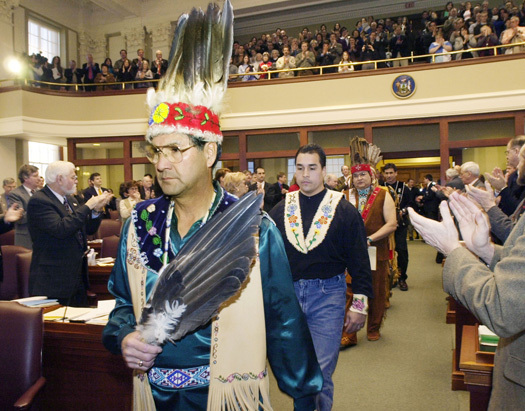 In 2011, members of the Wabanaki nations partnered with non-native employees and Governor Paul LePage to establish a truth commission to investigate and document intergenerational trauma within tribal communities. The Maine Wabanaki-State Child Welfare Truth and Reconciliation Commission (TRC), the first of its type in the United States, marks one year of work this month. “Maine leads a significant effort to bridge a divide of mistrust and marginalization between indigenous communities and state institutions,” said Eduardo González, Director of ICTJ's Truth and Memory Program. The Maine Wabanaki-State Child Welfare Truth and Reconciliation Commission (TRC), the first of its type in the United States, marks one year of work this month. Located in the Northeastern-most corner of the United States, the state of Maine is one of the most rural states in the country, and it is also one of the least racially diverse. Comprising just 1% of the population are the state’s indigenous groups, which have experienced generations of racism and discrimination, policies of economic marginalization, and cultural erosion. The Maine Wabanaki-State partnership’s serves as a valuable model and inspiration to others in the United States and indigenous nations worldwide. While most truth commissions operate as processes of inquiry and transformation within a nation, the TRC is a joint effort on behalf of the State of Maine and the sovereign indigenous Wabanaki nations. Maine’s state motto is Dirigo, or ‘I lead.’ The truth commission is, indeed, a demonstration of that spirit, and it may present important lessons to Native American advocates elsewhere. The commission focuses on the experiences of children in the welfare system, a situation that is gaining visibility across the United States, due to recent conflicts and complex cases. Urgent attention to indigenous child welfare is fundamental, as indigenous children are disproportionately represented in the system, often as a result of racism, and prejudice against indigenous families. The Maine-Wabanaki truth commission is also a leading example, in that it is the result of a direct agreement between the indigenous nations and the state. It is not an institution designed and implemented “from above”, but resulting from the tireless advocacy of indigenous activists, which continues today, as the commission relies on civil society groups to carry out several of its activities. The development of the TRC is best understood within the historical context of the US government policy of forced assimilation, an effort directed at stripping indigenous people of their culture, heritage and language so that they would adopt the majority white American culture. The assimilation policy was often presented as a gentler alternative to violent physical removal and attacks; but its explicit intentions were clear: to eliminate specific indigenous identities and cultures, submerging individuals into the dominant group. The destruction of Native culture is often referred to within indigenous communities as a “soul wound,” from which Native peoples have yet to heal. In the 1950s, the federal government created the Indian Adoption Project, through which thousands of indigenous children were forcibly removed from their homes and placed within white families without the consent of family members or tribal officials. Maine was particularly behind the mark in recognizing the rights of indigenous nations, and it was not until 1967 that they allowed indigenous people to vote in state elections; they were the last US state to do so. "Maine leads a significant effort to bridge a divide of mistrust and marginalization, by using a horizontal, nation-to-nation approach." In 1978, Congress passed the Indian Child Welfare Act (ICWA) after a period of increased awareness of the impact of forced removal on indigenous culture and mounting evidence of widespread neglect and abuse in adoptive homes. The ICWA recognized the value of indigenous culture, created legal protections that would allow indigenous children to stay within their communities, and granted tribes the status of “third parents” in welfare cases. Although the ICWA was an important step, the policy was not immediately enacted. The relationship between the Wabanaki tribes and the state of Maine remained tenuous, as they struggled to work through the legacy of mistrust, racial tension and intergenerational trauma. In 1999, a group of advocates within the Wabanaki tribal child welfare program and the Maine Office of Child and Family Services began to meet in an effort to try to find a solution. In 2011, the chiefs of the Micmac, Maliseet, Passamaquoddy and Penobscot nations joined Maine Governor Paul LePage to sign a mandate establishing the Maine Wabanaki-State Child Welfare Truth and Reconciliation Commission. Last winter, more than 200 people gathered in central Maine for a day of performance and prayer at the official seating ceremony of the TRC. The five Commissioners are from both indigenous and non-indigenous backgrounds: Secretary of State Matthew Dunlap; gkisedtanamoogk of the Wampanog tribe; educator Carol Wishcamper; Dr. Gail Werrbach, Director of the University of Maine School of Social Work; and Sandra White Hawk, Founder & Director of First Nations Repatriation Institute, and member of the Lakota Sioux. Since being seated, the five Commissioners have been meeting regularly with Wabanaki communities, Maine’s Department of Health and Human Services, and non-native community members. Performance and oral storytelling, as integral parts of Wabanaki history and culture, are essential components of the tribal-led TRC process. The destruction of Native culture is often referred to within indigenous communities as a “soul wound,” from which Native peoples have yet to heal. The incorporation of indigenous heritage into the TRC enables the Wabanaki to use their culture to empower the community and facilitate the healing process. In November, the TRC held its first community listening session at Sipayik. Denise Altvater, Passamaquoddy tribal member and Youth Outreach and Education Coordinator at Maine-Wabanaki REACH, was taken from her family at age 7 along with her five sisters and placed in a non-tribal home where she was repeatedly abused. Altvater participated in the Sipayik event, and believes that testimonies can help to deconstruct the historical trauma and heal communities. The work of the TRC is particularly significant given the historical context of indigenous nations as among the most marginalized populations in the world, whose experiences are compounded by existing structural violence. Though the Commission is focused with investigating only one aspect of the experience of Maine’s indigenous nations, its contribution can be significant beyond an examination of the child welfare system, encouraging future efforts to look into structural, historical wrongs. The Commission faces significant challenges ahead, which will require not just their own efforts, but increased support from government and civil society in Maine. In the time that remains, they must reach out effectively to all persons and institutions that can contribute, as well as educate all citizens of Maine on the importance of this endeavor. Throughout this process, they will also have to engage tribal and non-tribal Mainers in a productive dialogue on where they would like to take their relationship in the future. Time is also a notable challenge, as the TRC has just over a year remaining to fulfill their mandate. According to TRC Executive Director Heather Martin, the approaching deadline gives the Commission an undeniable sense of urgency, yet expectations remain high. Commissioner Matt Dunlap agrees. "It is a remarkable group," he said. "We have a lot to do, but certainly the right people to do it." ICTJ works with the Maine TRC through our Truth and Memory program. ICTJ’s engagement with the Maine TRC is one of several ways ICTJ is working to provide assistance to indigenous groups engaging with transitional justice measures.